Falcon Fodder in The Blade reports in a series of game notes that Heath Jackson (WR) and Robbie Goble (DE) are both questionable for the game Saturday. Look, this is one of D1's most premier programs. Since 2006, they have gone 13-1 three times and won two BCS Championships. They have been seeing harder times the last two seasons, going 15-11 over those two years. They don't publish a depth chart, but according to Phil Steele, they have the 50th most experienced team in the country, which is in the top half. Andre DuBose returns as the nation's 21st best kickoff returner and kicker Caleb Sturgis was 3rd in the nation in Field Goals. MLB Jonathon Bostic was T-9 in the SEC in tackles. They were -12 last year, which normally points to a turn around. They are breaking in two new guys this year. Driskel and Brissett will split the first half with each one of them playing a quarter. Both played last year during Brantley's injuries, but neither distinguished himself. Driskel is more of a dual threat dude and Brissett is a drop back guy. Based on the play in the first half, coaches say they will pick who QBs the 3rd Q. They were 71st in scoring last year, something that has been a pretty big issue in Gainesville. They were 105th in total offense, and 5.4 yards per play was less than BG had. They were 73rd last year in rushing offense, at 4.0 yards per carry. They lost their top two backs from last season and their backs figure to be in the middle of the pack in the SEC. They were also 71st last year in passing efficiency. They are breaking in two QBs, but their receivers do appear strong and they have good TEs. Last year, they ran the ball on nearly 60% of their offensive plays, which is really high. They created fewer than 3 red zone attempts per game, which is below average. They were 35th in red zone% but 14 were FGs, so their average of 4.5 points per trip is only about average. They didn't last year. They gave up sacks on 7% of their pass attempts. OK, listen. A couple notes. First, I know that Florida developed these numbers playing in the SEC and not in the MAC. I'm just evaluating them on their own merits. Second, you remember that the Very Large Charlie Weis was the OC down there last year and know they have a new guy, which throws a lot of this into flux. His name is Brent Pease, and he coached at Boise. Suffice it to say that it does not appear that offense is going to be the Gator's calling card but it could be surprisingly good once it plays out. They lost 8 starters off a really good defense. The Gators were 8th in total defense, allowing only 4.5 yards per play. They were 20th in scoring defense. Now, as I mentioned they did lost some guys, but they seem to be re-loading on this side of the ball. Phil Steele ranks them as having the 3rd best defensive line, 5th best linebackers and 9th best D-backs in FBS. They allowed only 3.4 yards per carry last year, which was pretty good and it would figure that they would continue to be effective against the run this year. They were 28th in pass defense efficiency last season, and I would figure they are likely to be better this year. Their stats are a little misleading, because teams ran on 60% of their plays. Excellent. They were second in FBS...28%. They were 80th in the country in red zone percentage, but were actually better than that. They allowed only about 3 trips per game and 4.95 points per trip. Very well. On paper, they were 44th in the country, but we have established that teams ran against them, so it ends up being 8% of their opponent's passing attempts ended up as a sack. Phil Steele ranks Florida has having the best special teams in the country. Also, special teams are being coordinated by former BG Assistant DJ Durkin. 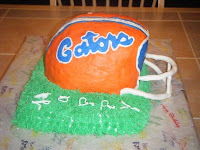 We don't have a category for it, but Florida blocked six kicks last season in 13 games, so we have to be on our guard. They switched punters mid year and the guy they have now put about 2 yards more on every punt. 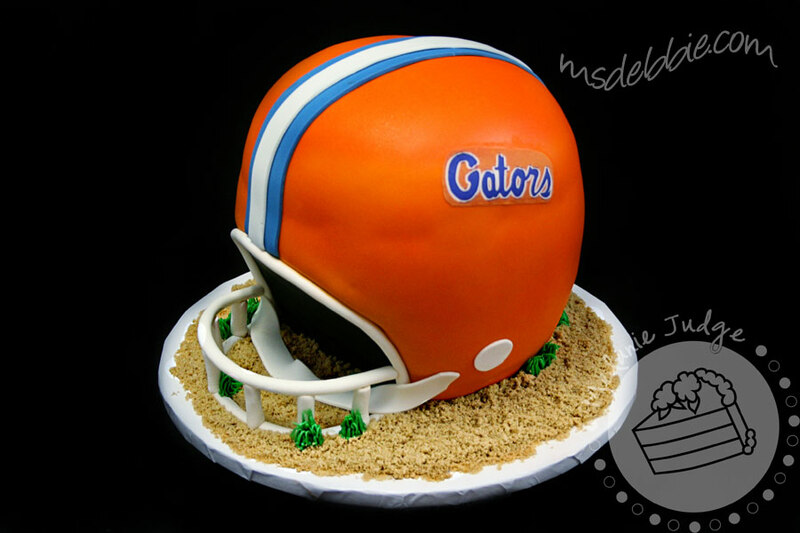 It is unclear who is handling this for the Gators this year. As established above, their kicker, Caleb Sturgis is really good and might be the best in the country. He made 3 over 50 last year with a long of 55. Of course, this whole thing is changed now with the new rule. Last year, Sturgis had 10 TBs in 58 kicks, and figures do better if that is how they decide to play it. Teams averaged starting on the 25 under the old rules, which is very good. Same caveat about the new rule. Andre DeBose was really good last year, had a TD and the Gators were getting the ball on the 31 off kickoffs, which is also very good. We should play for touchbacks. 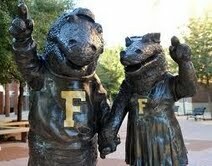 Bronze Mascot statues? uh, OK.
Also: the holding hands is icky. Look, this is a tough assignment for any MAC team. You are on the road against a top 25 team. For years, have rarely lost at home, and while that record has softened in recent years, it is safe to say that's a tough place to play. Other than Florida State, they have not lost a home non-conference game in years. Now, as unlikely as it might be, there are games like this every year where the team that is the underdog puts it together and gets the win, and this could always be one of those games. 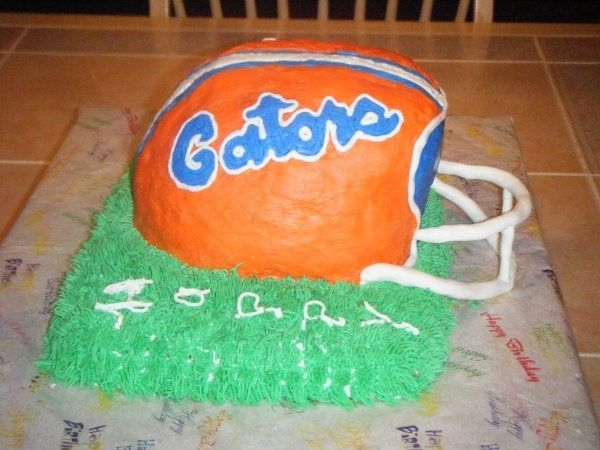 We are 29 point dogs, and Florida won their pre-season tune ups by 38 and 39 points last year. Looking forward to seeing our guys on the field, and you never know. The MAC Blogger Roundtable is BACK! The MAC Blogger Roundtable is back! We have more blogs than ever before, which means that 4-5 blogs will be featured each week on a rotating basis, and this was a bye week for the Falcon Blog. Having said that, it is pretty interesting reading. Clawson is not on the hot seat. The MAC should add a 14th team only for a really good fit. Anyway, check out what the braintrust had to say. And here it is...the Falcons released their home basketball schedule for the coming season. You can see it below. In the past, the schedule was modular--you played the first 5 games in your division, the middle six in cross division games and the final 5 back in your division. That's being changed...now the first 11 games are mixed and the final 5 are strictly within the division. I do like finishing within the division because I think it makes the races more exciting and limits the advantage someone might get from a random schedule where maybe one team had an easier schedule in the last couple of weeks. 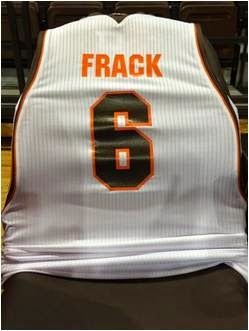 For our Falcons, it is clear that the marquee matchup is the long awaiting arrival of MSU at the Stroh. I'd hope we can expect a sell out for that one. The second marquee event is the pre-season NIT. This is a nice get for BG, and, as noted by Coach Orr, provides us with additional opportunities to bring our team around before MAC play starts. It is not clear who the opponents will be, but they first two games are in Ann Arbor, which is nice for our fans. If BG wins then it is on to Madison Square Garden, if BG loses than its is onto two more games at an undisclosed location. Beyond that, there are some games that are decent home D-1 contests, if against people we typically play. For example, we play Detroit a lot. They were in the NCAAs last year. Youngstown State was a little over .500 last year, and both Wright State and Samford lost 19 games. On the road, BG will visit South Florida (won two games in the Big Dance), North Dakota (hopefully winnable), and a very good Temple team we beat at the Stroh last year. Also, we now have a non-conference game in the middle of the MAC game. There's the bracket buster and then there is a visit from New Orleans. They are an independent, which means they have open dates throughout the year, and so they will make a trip to BG in February. We have a decent number of home games, which is good for fans, even though they are all bunched up in a couple of weeks (the non-conference games). There's only one non-D1 game on the list, and it is the first game (which I also like) and we can see the games in Ann Arbor, too. The other home games are not super exciting, but the most important thing is that we have home games on the schedule in the non-conference season. Toledo News Now reported last night that former BG football player Cody Silk sued Bowling Green State University and Coach Clawson (along with 3 others) for permanent neurological damage related to concussions suffered while he played football for Bowling Green. The suit alleges that as a freshman Silk's helmet did not fit properly and he suffered four concussions and was not treated properly. It also alleges breach of contract when Silk's scholarship was taken away. You can watch the news report below to get a briefing...mostly on the allegations, since BG does not respond to ongoing litigation. I have no knowledge of the facts of this case beyond the allegations in this story, but I do believe you are going to see increasing numbers of lawsuits of this kind in the coming years. Here is what was said about Cody Silk in BGSU's release when he signed his LOI. High School: Currently attends Warren De La Salle High School ... coached by Paul Verska ... earned All-Catholic League Honors ... ranked as the No. 47 player in the state of Michigan by the Detroit Free Press. That was in February 2010. In March of 2011, after his redshirt year, we were reporting that he was no longer on the roster. He was a Clawson recruit and not a Brandon holdover. Because he is suing the State of Ohio (BGSU is a state University), the case goes to the Ohio Court of Claims. UPDATE: The Sentinel has some more details and timelines on this issue. Final Pre-season Blog Poll is now on the air! Always a happy day!! Blog Poll is back. And, I joined 4 other voters (including Bull Run) in putting Ohio U in the top 25. They have the potential to be a very good team this year. Three things for a Tuesday leading up to the opener. Dave Hackenberg of The Blade did a nice piece of Falcons d-lineman Chris Jones. Best detail of the piece: that when BG practices long passes, they take Jones out because otherwise he gets to the QB and nothing gets done. Which is nice, except, you know, once in a while we might practice blocking him. Anyway, the story also says that NFL scouts are coming by to see Jones during Fall practice, so that will be interesting to watch as well. One thing I keep harping on is that this Falcon team is still young. Not AS young as last year, but young. In fact, the game notes for Florida indicate that Phil Steele says BG has the 10th youngest roster in college football. I just think we need to keep things in perspective...this is not a senior-dominated team. And with THAT in mind, one last thing. I'm picking up some stuff from the MAC Blogosphere that people feel like Dave Clawson is on the hot seat this year. Let me just say that I don't think he is, for the reasons listed above. Now, if the team goes 0-12, that's something different, but I think Clawson has until the end of 2013 to show he has the program going in the right direction. I think that for a bunch of reasons, one of which is that I think its fair. Also, he has a contract, and we don't buy contracts out lightly. Yeah, thanks, I do remember Gregg Brandon, but there were off the field issues as well with him. The football program has a record high APR and is getting better along the lines that the Coach told us to expect, and I think Clawson's seat is 0% hot. The first Depth Chart is Out!! First, as was suspected, BG will start two redshirt FR on the oline. (That's Fahn Cooper at LT and Alex Huettel at RG). Also, our only 5-Sr. o-lineman, Chip Robinson, who was heir apparent at C, has been put into an "OR" situation (as in the starter will be him OR David Kekeuwa, the JUCO transfer who seems to made a real impression). Which means, conceivably, even though we lost only one lineman to graduation (Bojicic), and we talk about a more experienced line, we could start 3 players on Saturday who have made precisely zero starts in D1. Not saying that's good or bad, but it does point to the struggles we have had and that it may not have been merely inexperience holding the line back. Second, there are a couple of surprises at WR. In the slot position, Ryan Burbrink (walk on) is starting over Heath Jackson who finished last year as the backup in that spot. Shaun Joplin has one of the wide out spots but I'm a little surprised that Chris Gallon beat out Je'Ron Stokes. Obviously, all these guys will get snaps and we probably have 4 and 5 wide sets, but there are at least a couple of surprises at WR in the base positions. On defense, the fourth spot at D-tackle is being filled by Taylor Royster, who I don't remember being a signing day name. He's only 5'9" and 252 (as listed) which is pretty small to be on the inside, so he may only play on limited sets. Ronnie Goble is listed as back up at D-end, possibly due to his injury. At MLB, true FR Coy Brown III is in the back up spot. R-FR Gabe Martin will start at ROVER, a critical hybrid position in our defense. At Weak safety, Ryland Ward is listed as the starter. Aaron Foster, last year's starter, is on the 3rd string. True freshman Will Watson is listed as a backup at one of the corner positions. At Kicker, Stein and Tate remain in an "OR" situation. Burbrink is also listed as the main punt returner. So, that's the first look at how we will deploy in Florida. We start the season relatively healthy, Goble notwithstanding. I continue to think that they key is the performance of our offensive line, which are working hard to rehabilitate and we can only look forward to seeing that work out. BGSUfalcons.com put out this report on how ticket sales are going, and I was pretty encouraged. I don't recall the Athletic Department putting this kind of info out, and I suspect partly they are trying to show results from their decision to outsource the ticket department. Anyway, season ticket sales are up 30%. That's good in anyone's book. Also, there was a 92% renewal rate compared to 83% a year ago. And, there are 500 more season tickets sold. First, 83% renewal rate after than 2-10 season is nothing to sneeze at. I believe our core fans are pretty loyal, there just aren't enough of them. Second, season tickets are the best measure of success. If the weather is nice, we'll have a bunch of people show up for that game against Idaho, but when it rains in October, who's going to be out there? Or, who has going to have paid. Third, I was very impressed with the promotion this year. I had a football player come talk to me at a basketball game this year and personally ask me to renew my tickets, which was an incredibly nice touch. I would have done it anyway, but it added a high touch element. I like the two tickets to a road game they included and the parking as well. I'm not big fans of all the outsourcing (especially the comical security corps) but I have been pleased with the ticket packages and promotion efforts. Fourth, as a piece of advice, I believe the next stage of success can be achieved by upgrading the gameday experience. Better concessions in particular would be great. Can't wait to start the home season in a couple of weeks. Good job to the Athletic Department. If we can create a great experience at the Doyt, we can keep building on this success and have good crowds there every game. So, our second annual effort in futility and humility is to predict the results of each game on our schedule before the season starts. Then, when the season is over we can all look back and have a good laugh about it. Anyway, here goes. I see us going 8-4 and 6-2 with a 2nd place finish in the East. Key wins we need to hold onto are Miami and EMU, and if the OU or Toledo game can go differently, this team could really achieve. As with everything Falcon this year, it is important to remember that we still are playing very few seniors and that has a major impact on how your team wins tough games. We still have question marks up front, especially on offense. Even with all that, I don't see us less than 7-5 and I think we're in a bowl game, worst case. This is not the greatest Florida team ever (though Phil Steele has them winning their division in the SEC) but they have 17 starters back and are playing on their home field, where they are very tough. This will be a difficult game for the Falcons. BG beat them last year and Idaho finished 2-10. They lost a bunch of guys off that team, and this year could be tough. They are in a tough spot with the death of WAC football and could end up in FCS before it is over. Anyway, I like the Falcons pretty strongly at the Doyt in this one. This is going to be a very interesting game. We don't pick wishes in this space, so I will say that rationally I think BG has closed the gap tremendously with the Rockets since the debacle two seasons ago and this game is very winnable for BG, but at the Glass Bowl, the Rockets get a slight edge. Similar to the Florida prediction, I just think this team is very tough for us to beat on the road. The only caveat is that the Hokies seem to lose one inexplicable game every year and why not this one? Things get a little easier here. 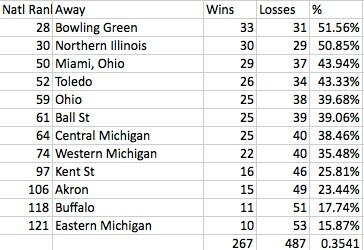 Even on the road, BG should be able to take down the Zips in the first meeting between the two teams in several years. A key game in the season. BG won in Oxford last year and needs to translate that into a win at the Doyt. I'm picking us to win because I think we're the more complete team on the offensive side of the ball. UMass won't always be like this, but right now, they are not ready for FBS competition and BG should win this one, even a long way from home. Not the pushover it once was, I still like the Falcons in this game. Until I see otherwise, I think the hype in Ypsi has gone a little bit too far. This is a good test for our ability to stop the run. If, in fact, we are not stronger on defense than we were last year, then EMU will probably grind this one out. BG should have beaten OU last year and the fact they didn't has been beaten into the player's heads all through the summer. If things unfold as I suggest, this should be the key game in the East. It is a weekday game on the road, and I think a tough game for us to win. I like OU's team a lot. Having said that, a win here and BG is back. Kent continues to sort of lurk around the middle of the MAC pack. They aren't great at QB and on our Senior Day, I think BG is just better than Kent and gets the win. Despite giving up home field for what could be an important game, I think BG is better than Buffalo and closes out the win on a soccer field. Two Falcons got their release recently from NFL training camps. First, Scott Mruczkowski was released after 7 years in the NFL with the Chargers. He was cut by the Chargers a week or so ago and hooked on with the Panthers but then got was cut by them a few days later. Certainly, 7 years in the NFL is an accomplishment for any football player. There's obviously a chance he could get picked up again, but if he doesn't, it was a good run. Second, Kamar Jorden was cut by the Vikings. He broke his hand before things got too far, which obviously makes it difficult to show much. Korey Lichtensteiger is trying to make his way back onto the Redskins after a serious leg injury last season. He is on the roster, but did not play in the game against Indy Saturday. Shaun Suisham is Pittsburgh's kicker. Mruczkowski: Corrected for 7 NFL seasons. Also, Mruczkowski has apparently announced his retirement, saying his "heart wasn't in it." The season ticks closer everyday. 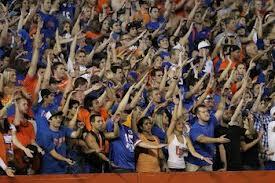 We are one week from kickoff in the swamp. With that, there's a little bit of pre-season business to take care of, the first of which is to make my predictions for the MAC. 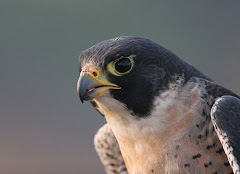 Tomorrow I will predict each game in the Falcon season. As always, we will check back at the end of the year and see how stupid this all was. I had my doubts, but Frank Solich is clearly creating a true program down in Athens. I ranked OU 25th in my Blogpoll ranking earlier today, and I think this is the best team in the East and in the MAC. They have the top QB in the East, are very strong up front and have strong defensive backfield. 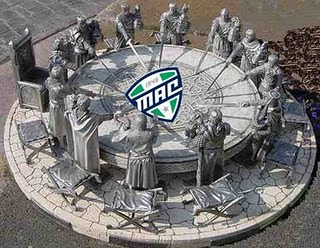 Finally, my guess is that the MAC Championship collapse will create a sense of mission. I like the Falcons a lot this year. I don't believe we are as strong as OU on the offensive front or at QB, OU has a lot more seniors on their two-deep than BG does and when we play OU the game will be played in Athens, so for all those reasons I think OU edges out BG for the East title. Miami is on the road back, much as the Falcons are. They will bring a very strong defense to the games this year, but will continue to struggle on offensive due to issues running the ball and on the offensive line....not that these won't be improved over last year, but they will still remain liabilities. They play @BG this year and for all those reasons, I think they are 3rd. Big fall off here. I keep expecting Kent to emerge and turn into a good team and it keeps not happening. I think Darrel Hazell is a good coach who has the ability to turn the program around if it can be done. The defense that has been built over the past few years still remains, but the offense is really going to struggle. They were poor at QB, had a big competition and then named the incumbent to the job again and they have gaps on the O-line. Also, they play @BG and @Miami. Another team trying to dig out of a big hole and probably frustrated at the progress they are making. They have talent at QB but it may not be ready to go experience-wise and will struggle on both sides of the ball. I believe this year puts Coach Quinn firmly on a hot seat. Big name Terry Bowden takes over here, but it is going to take some time. They are just an awful team....the defense appears to be historically bad and the offense only slightly better. This program can be brought around, but Bowden has very little to work with. Jumping up from FCS is tough (even to the MAC) and it will show for UMass, who was only 5-6 last year against an FCS sked. They are committed to building a program and are similar to Temple when Temple joined the MAC. This is going to be a long year. I feel like WMU is the team that tricks you every year. They should always be better than they are. Can this be the year? Their perennial West rivals (UT and NIU) are down a hair this year, and WMU has the best QB in the conference and a strong offensive unit. They have stuck with Cubit and I'm thinking this is the year they get it done. They also play UT and NIU at home. Things are going to be interesting at UT, as it evolves out of the post-Beckman era. Matt Campbell is an interesting choice. I'm not so hung up on his age as I am on the fact that promoting from within has had very mixed success over the past years in the MAC (BG, Miami, Ball State). They should be very good this year, strong at QB and up front. The defense probably remains a work in progress and while they lost a lot at RB, name a time when they didn't have RBs. With a good game in K-zoo, they could easily win the West. The MAC's strongest program over the last 10 years, NIU brings a solid team back and has a change to compete in the West. They have an unknown at QB and have to replace almost the entire offensive line, but should be improved on defense. I think they are well coached and have a chance to compete in the West, but I don't see them higher than third. The Chips have a shot to be a sleeper. The team is not that great, but they have a favorable cross-over schedule and they had a poor turnover ratio last year--Phil Steele has shown that teams like this tend to get better the next year. They have a good O-line, but Radcliffe has never really turned into a strong QB and the defense will have trouble dealing with the potent WMU and UT attacks. I think Dan Enos is on a hot seat and this could be a tough year for him. Fifth here, but I suspect if they played in the East we'd be picking them for 4th. Phil Steele mentions that they were badly outgained last year and were probably lucky to have the record they do have. I like them better than EMU on the offensive side of the ball (Keith Wenning might be the best kept secret in the MAC) and they actually start their season with EMU at home this week. EMU did the big surprise thing last year, winning six games (though two were against FCS competition) and I think they will come back down to earth this year. This program has not had a winning season since 1995, which is almost unfathomable. I like them at QB and English plays a tough run-oriented style, but I don't see their defense being able to sustain them and I can't imagine them finishing higher than 4th. Scott Thomas announced on twitter this week that he will be playing in Germany for the Cuxhaven BasCats (get it? Cleeeever!). They are ProA, which means they are one level below the top professional league in Germany. I am always happy for this, not just because it represents a professional basketball career for our guys, but also because I think living overseas is a terrific experience for someone who just graduated from college. Congrats Scott!! First, kickoffs will be handled by Anthony Farinella. You will remember that Farinella was a late recruit addition on signing day and he was noted for being able to really drill kickoffs. That was under the old rules, and with the kickoff now bumped out to the 35, you have to figure a guy with a good leg can get a bunch of touchbacks, which is better for everything. "He kicks it further than the other guys." As for FGs, the job is still open between Tate and Stein. He says they are both better than the guys we had last year, which is cool, since one of them (Stein) is a guy we had last year. Anyway, Tate has a better leg and Stein is more accurate, and that's the dilemma. This is just me, but teams have used a separate kicker for short FGs and XPs and another one for long FGs. I would think that might work pretty well. Finally, there was some talk about Matt Schilz, where he stands, and whether it will be difficult to determine his progress. He said that he would be thrilled if Schilz threw for 1,000 fewer yards and we won 5 more games, and that, of course, is 100% true. If we won 5 more games (making us 10-2) there is nothing (repeat nothing) on a statistical basis that would diminish how thrilling that would be. The Sentinel Tribune is reporting that Jordan Hopgood has been suspended for the Florida game for a violation of team rules. Hopgood was arrested in the evening of Aug. 17 and charged with sell/furnish alcohol to a person who is underage. He was coming back from an injury that caused him to miss the last 3 games of last year. He had just started taking live snaps during the recent scrimmage and figured to be a part of the RB mix for BG. The football team is now out of "camp" and into regular practices. You can go to bgsufalcons.com and see what Coach had to say, which wasn't too much from a newsworthy standpoint. I'm sure the players are looking forward to hitting someone else and I'm sure Coach is interesting in talking about it and I'm sure we're ready to hear about it. Anyway, Falcon Fodder in The Blade touched based on the injury situation. The only two players Coach listed as "out" for Florida where Hunter Maynard, who we learned earlier this week would be out for the season and Sr. co-captain Bart Tanski, who broke his collarbone. Tanski will miss six weeks, but (as reported in the Sentinel yesterday) will make the trip to Florida as a captain. No word on Ronnie Goble, who is injured but has (by inference) not been ruled out for Florida. Note also that David Kekuewa is pressuring Chip Robinson at C and they may split time there. Just a note here, as we see the team move toward the opener in Florida. There's no other way to say it except that the way teams play today, you need a bunch of d-linemen. I don't really understand it, but if you watch a game, they rotate d-linemen constantly, almost on every play. (The part I don't understand is why they don't do the same for o-lineman, but they don't). So, you really need 8 d-lineman. Coach has said the same earlier in the Fall. BG left the Buffalo game last year and returned 5 players who had game experience: Chris Jones, Darius Gilbert, Jarius Campbell, Ted Ouelette and Hunter Maynard. With Gilbert's suspension and Maynard's injury, that's down to 3. If you decided you needed a 4th, you do have true freshman Mike Minns who is listed on the roster at 317 pounds, so he could be game ready, but that appears to be about it. So, you're left with either trying to push a three-man rotation, or moving Minns up...or, I guess, moving one of the guys from the edge inside. It will be interesting to see how this plays out, but for our defense, it is very important. We have to be able to stop the run and that begins up front. One last note. By all accounts, Chris Jones is setting up to have a beast of a season. If that pans out, he will draw double teams, which will at least allow the other guy to have an easier assignment. The Falcons scrimmaged yesterday for the final time before life action starts on September 1 in the Swamp. I listened to Coach Clawson's presser. The biggest news is the running game, and he spent a long time talking about it. He first noted, to no one's surprise, how poor a short yardage team we were last year. As a fan, I might add that it wasn't just last year, but anyway. He says we have five "playable" running backs. Samuel is the starter, with Pettigrew, Hopgood, Givens and Martin also being capable of being productive. Hopgood saw his first "live" action in the scrimmage. Samuel is small and you always worry about injuries, but with the depth, he won't have to take the carries that, for example, Willie Geter did, and if he is injured there are backs behind him. Coach was especially happy with the short yardage play. He talked at great length about a play where Pettigrew saw a small crease and gained 2 yards on a 4th and 1. I think there are roles for all or most of those guys. For example, I can see Samuel getting most of the carries from the base set with Givens spelling him. Hopgood would run the wildcat (which he was really good at) and Pettigrew would be the short yardage and redzone back. Running isn't just about the backs. Coach continues to be pleased with the progress of the offense line, which he says is stronger and playing in a more cohesive manner. It is hard to estimate how important it will be for the team to be able to run the ball. Short yardage conversions are just part of it. Because we have an unsettled receiving corps, running the ball moves defenders close to the box and gives the receivers the opportunity to work against fewer guys, which will help them out. Also, it will take pressure off Schilz and allow us to see what he has on a more functioning team. Beyond that, coach was pleased. He liked the energy. And, he said that both the offense and the defense won parts of the day, which is the way you like it. One last note. Hunter Maynard is out for the year. Bart Tanski injured his shoulder. Goble will be back next week, they hope. A couple CBs sat out as a precaution. Maynard played as a true freshman, so he can now redshirt this year and have three years left. It is one of the signature moments in Falcon sports, if infamy counts. The year was 2002. Falcon men's basketball coach Dan Dakich had done what was always expected of him...he was doing what people on the Bob Knight coaching tree did...he was moving into the upper reaches of college basketball. Our team was 79-41 over the previous four years. It is no secret what happened next. Dakich spent a week in Morgantown and then decided to return to Bowling Green. He never again had success at Bowling Green and was, in retrospect, on his way out of coaching. Our program has also not had any real success since that day in 2002. I know you have to be careful about taking events in time and making cause and effect relationships when you are looking back. You can decide for yourself. The facts are what they are. In the 10 seasons since, BG has had two winning years. During that time, we are 143-165. For whatever reason, Pete Thamel of the New York Times decided to write on this story today. You can check it out here, but it describes Dakich finding incriminating evidence of the program at WVU (a player promised $20,000 per year), reporting it, being threatened (in the presence of his wife) and then returning to BG. It also describes the denials of WVU officials and the fact that the NCAA investigated and took no action. Dakich haters at BG believe that he got cold feet and inflated his concerns about the payments to get out of the deal. This story breaks down to "he said, he said" in a sense. 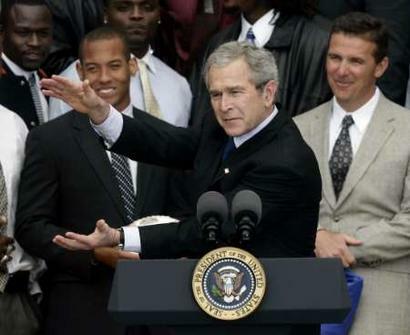 And I do not have a good explanation for why the NCAA never acted. The WVU President says that Dakich's account of their meeting (in which Dakich says he threatened to "destroy" Dakich) was "grossly exaggerated." Which, in the annals of denials, is the kind of thing that stands out as not exactly a categorical statement of innocence. And, Dakich describes how sad the player in question was when he recounted a life of being "owned"....which is not the kind of detail you come up with when you are making something up, unless you are a sociopath...which I don't think Dakich was. Finally, it wasn't just Dan in the room. I mean, if you have Dan and his wife exaggerating something to that level of detail on one hand and a big-time college president threatening to "destroy" someone who is trying to expose something he'd rather have kept quiet, and you ask me which is more likely...I'm going to tell you the second. Anyway, there are three people who know what was said in that room, and I'm not one of them. An interesting story and an interesting chance to reflect on this moment in Falcon history. First, for all the talk of how we are more experienced, this is still not a relatively young team. There are only 2 seniors on the entire defensive two-deep and 3 on the offensive two-deep. Tons of juniors though. Even more interesting is that we have talked on and on about how much more experienced our o-line is, but this depth chart shows that there is at least a possibility of 2 of the 5 starters being r-FR making their first game appearances. I found that surprising. We have a punt returner I never heard of before. Ryan Burbrink (rFR) of DeMatha (yes, that DeMatha) is probably a walk-on. He was all-state in Maryland in HS. I found a forum on the Baltimore Sun that referred to him as a "shifty white boy" and even if that is a little inelegant, they seemed surprised that he was not recruited more than he was. Anyway, it will be interesting to see how he does. Finally, the injury update. Ronnie Goble, starting DE, has an ankle sprain based on Coach's video on the website yesterday. It doesn't sound terribly serious and they hope he can be back for Florida. The Blade has the news today that D-lineman Hunter Maynard has a knee injury and could be lost for the year. He was expected to be in the rotation on the d-line. He played as a true FR last year. True Freshman Erick Hallmon has left the team, according to a story in The Blade this morning. He was in this year's class...here is what we wrote about him at the time.....italicized part is a summation of the comments from Coach Clawson. In general, this guy appeared to be a pretty good player who was recruited by other schools. According to ESPN.com, he was the highest ranked recruit we had in the class. High School: Currently attends Cardinal Gibbons High School ... coached by Mike Morrill ... team captain ... four year starter ... earned second-team all-county as a senior ... recorded 65 tackles, one interception and one touchdown that same season ... played in the Broward All-Star Game and the Nike South Florida versus Dade County All-Star Game. Patience helped as BG outwaited a Texas Tech verbal and then other teams. Could be an OLB, even a Box LB. Could play special teams early. He is the second Floridian to leave the program this spring, the other being DB Dernard Turner. On a Training Camp update, Kamar Jorden is in the Vikings camp, where he suffered a broken hand. This is pretty disappointing and would make it very difficult (obviously) for him to make the team year. So, as you know, I have been skeptical that home field is as important in college football as it is in college basketball. Phil Steele recently published the home and away records for the last 10 years in the FBS and they do reveal some interesting results. First, I'll look at a couple observations, and then we will look at the MAC. First, in general I was right, even if it was less than I thought. 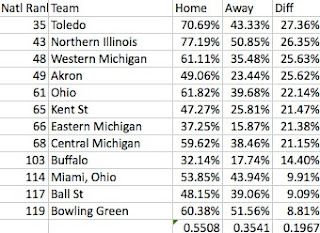 The home team wins just under 64% of the games. Now, that is less than in basketball, if only by a little. However, the presence of FCS games means that teams in FBS start with a 52% winning percentage and a significant number of the home games in the non-conference schedule are foregone conclusions. Both are true in basketball, but make up less of the overall total and have less impact. In the MAC, which is usually on the business end of those games in the early season, the winning percentage for the home team is only 55%. Let's look at the rankings. So, there are two clearly dominant home teams in our conference....NIU and UT. NIU is the 23rd rank team in FBS for their winning record, and UT is 43rd. Then, you have OU, WMU, BG and CMU more or less even as you move down. In total, 7 of the 12 teams in the conference have winning records at home. Now, let's look at the road records. Here, we see the home/road picture more plainly. Only two teams have winning records on the road, and the Falcons have the best in the MAC and 28th in the country at 51%. NIU is very close, and you can see from there how it plays out. 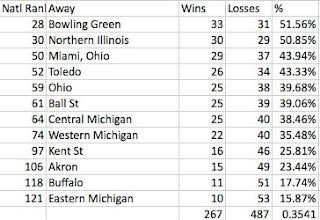 EMU averages one road win a year and Buffalo isn't much above that. Now, there is one issue outstanding here. When you look at the Steele rankings, you see that Boise has the best home record over that period of time. They also had the best road record--because they were the best team. 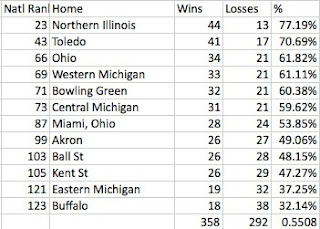 NIU clearly spent much of the last decade dominating the MAC West, as seen by their record home and on the road. So, rather than looking at who the best home and road teams were, you might instead want to know who had the biggest home field advantage. You could measure this by looking how much better teams did at home than on the road. Here, we see the MAC ranking better nationally, though again there is a tougher road schedule. Nationally, the difference was 23.7%, so the MAC actually had less differential (slightly) than FBS as a whole--this is line with the modest differences we saw on the first two categories. There are two types of team here. 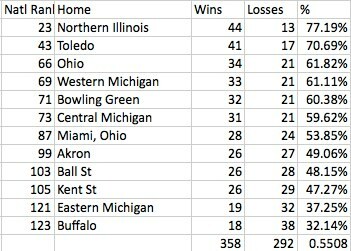 I thought we would see the Toledo and NIU teams who are so tough to beat at home and (in the case of Toledo) just average on the road. You also have teams like Akron and Kent which are not especially good at home but really bad on the road. Two thirds of the MAC (8 out of 12) have differentials above 20% and around the national average, so clearly it makes a difference to be playing at home and probably more than I thought. 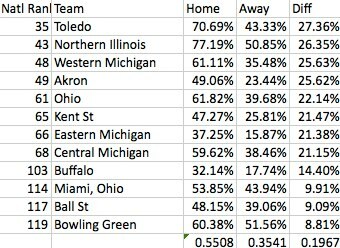 There's a big drop to the final four, which includes Bowling Green, which has not only the lowest differential in the MAC but also the 5th lowest in all of the FBS. Which is the result of only decent results at home and being pretty successful on the road. I think Falcon fans had sensed that we seemed to lose a lot at home, so here's hoping we can get our home winning percentage up in the 70% range, which is where our conference's most successful teams appear to be. The NCAA has a little problem. The current bowl schedule requires 70 bowl eligible teams and that has been a struggle for the past few years. I keep hearing there will be a movement to reduce the number of bowls but nothing ever seems to happen. The problem is compounded by the fact that four teams are now facing a bowl ban this season and there could be two more. So, the NCAA has adopted a new method of allowing bowls to "dip" into the pool of teams that were not already eligible based on the current standards (6-6, only one FCS win) and those are pretty meager to start with. You can check it out in this article. A bowl can only rely on these double secret exceptions once every four years. I never know, but I figure eventually these rules will be used to send some 6-6 BCS team to a bowl game over a qualified MAC team. I hope to be wrong about that. On the catch up a little, there's some stuff coming out of the scrimmage on Saturday at the Doyt, all drawn from coach's comments on bgsufalcons.com. Basically, he thought the offense got the better of the play and the only thing that kept it from being a great offensive day was (wait for it) the offense's propensity to self-destruct with missed signals and false starts and a turnover late. Let me know if that sounds familiar. Coach said we played poorly on defense, especially against the run, even though in general the defense has been practicing better. If you want something else to worry about, he says that none of the WRs have distanced themselves from the others during practice. Given that a couple seemed to start with a decent lead, that's kind of disappointing to hear. As Coach said, if we played next week, we'd be in trouble. He cited a couple of players who had made a couple nice plays but combined that with some missed signals. He thought the O-line played very well today. Finally, at RB, Anthon Samuel is the clear starter. Hopgood did not participate because they are bringing him along slowly (he is practicing) and Andre Givens has a minor injury and should practice again today or tomorrow. But, we are very deep at RB, which is a good problem to have. No other injury issues were mentioned. So, Mr. Rivals.com--you didn't have this in your list of offers back in the day. Urban Meyer offered a scholarship to LeBron James to play football at Bowling Green. When James was a high school sophomore, Meyer said, he offered the future NBA MVP a scholarship as a wide receiver, though Meyer envisioned James as a tight end. Meyer was head coach at Bowling Green the same year James finished his sophomore year of high school at St. Vincent-St. Mary in Akron, Ohio. As Meyer recalled, when the offer was made, James said, "Thank you very much. I'll consider it." Then James' coach started laughing. "What are you laughing at?" Meyer asked the coach. "Do you know who that is?" the coach asked. "That's LeBron James," the coach said. "Who's LeBron James?" Meyer asked. "He'll be the next Michael Jordan," the coach said. Interesting huh? Meyer was notoriously focused on football, so I completely believe he was the only man in Ohio who didn't know who LeBron James was. (Note the famous story of Meyer dropping his kids off at school on a snow day). 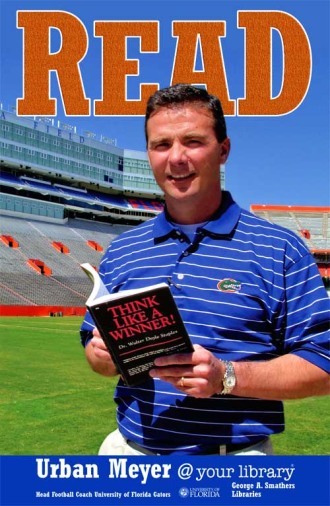 It is a funny story---Meyer goes on to say James would have been a Hall of Fame football player---and we are left only to dream of how James would have looked in orange and brown. Here's an interesting tidbit from out in the real world, most specifically at the Fort Wayne News-Sentinel. As I am sure you are aware, Ft. Wayne native James Knapke is a freshman QB at Bowling Green, where he is competing for playing time. The News-Sentinel made their way to Detroit for media day (OK, I'm catching up on things, OK?) and asked Coach Clawson how Knapke had been faring during summer workouts. There's nothing terribly newsworthy here....Clawson says Knapke is from a good program (3 straight state titles) and has made the adjustment a little quicker. He's also a good person. “More than anything we just felt that James was a winner,” Clawson said. And that's the kind of guy we never have enough of. Looking ahead, the athletic department has released the latest version of the upcoming non-conference schedules for football. One caution: these often don't materialize, so I wouldn't go booking a flight to College Park, Maryland for 2015 until we get a little closer. However, this does give you plenty of warning. For example, after this has been published, I don't want to hear you are "getting married" on September 13, 2014. You have plenty of time to find another day and still make the game. In the meantime, here are some observations. On September 26, 2015, BG is scheduled to put its all-time unbeaten record at Rose-Ade Stadium at risk. I'm honestly surprised Purdue will even schedule us. We have home and homes with Indiana (2 for 1), Maryland, Middle Tennessee, and Louisiana Tech. We will be playing a road game in Bowling Green...no this isn't the latest Greg Christopher scheme--we're playing in Kentucky. 2016 is the next return to Columbus. 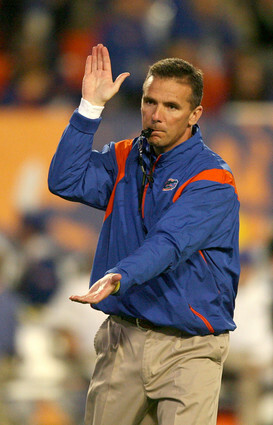 Any betting on whether Urban will still be there when that game occurs?